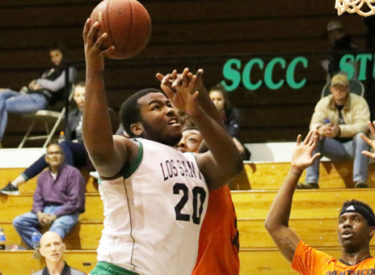 On paper, the Seward County Saints matchup looked favorable Saturday night in the Greenhouse against the Neosho County Panthers. The Saints, averaging over 82 points per game on the season going up against a Panther squad that had given up 80 or more in seven straight games. The projected outcome couldn’t have been further from the truth however as Seward shot under 29% on the night and managed just 68 points in a 72-68 loss to the Panthers to drop the Saints to 2-7 heading into the Christmas Break. In what was expected to be a shootout, it was a dog fight early on as the Saints held the Panthers without a single point for almost five minutes to start the game and without a field goal until the 14:15 mark, but were only able to open up a 10-3 lead in the meantime. Seward remained out in front by six, leading 15-9 midway through the half as both teams had their struggles on the offensive end of the floor. That’s when the Panthers stepped on the gas and the Saints turned the Greenhouse into the Icehouse. Seward managed just five points over the next 7:41 as Neosho went on a 25-5 run, turning a six point Saint lead into a 10 point Panther lead in the blink of an eye. The Saints found their footing at the free throw line, crawling back into the game at the charity stripe before four straight by Neosho before the first half buzzer gave the Panthers a 37-32 lead after 20 minutes of action. Seward shot just 24% in the first half, finishing with four more turnovers (11) than field goals (7). Neosho didn’t fare a ton better, shooting 39%, but the Panthers got up seven more field goal attempts due to just seven first half turnovers. Kevin Sims led the Saints with 11 points while Charles Beauregard had 6, but no other Seward player had more than 3 in the half. The Saints erased the Neosho lead early in the second half as they held the Panthers without a field goal for the first 3:18 to tie the score at 38. The two went back and forth until Deionta Nunnally cashed his first three of the season from the corner to give the Saints the lead back at 45-43. Seward used that to start a 10-0 run, opening up what at the time seemed like a comfortable 52-43 lead with 11:48 remaining. The Saints remained in front by nine at the under 10 media timeout and held that lead to the 6:00 mark as Ernest Carter turned a paint touch into two points to make it 63-54. Neosho cut the Saints lead to six with 4:09 to go, but in the defensive struggle, the two possession lead still felt relatively comfortable for Seward. Apparently too comfortable. The Panthers sliced through the Saints defense for nine points in 2:12 of clock time, evaporating the Saints cushion and taking a 68-67 lead of their own with 1:33 left. A free throw with under a minute to go tied the game for Seward, but the Saints wouldn’t score again while Neosho’s Austin Downing finished off his career best 24 point night with four in the final minute to seal a 72-68 win for the Panthers. The final numbers offensively weren’t pretty for the Saints, even against the league’s 13th ranked defense. Seward shot just 29% from the field, their worst mark since November 1st of 2014. Beauregard led Seward with 15 points while Sims had 13 before leaving with an injury. Carter finished with a career high 8 points and 8 rebounds in 27 minutes of work. The Saints fall to 5-8 on the year with the loss, dropping to 2-7 in Jayhawk Conference play, their worst mark in 13 years. Neosho improves to 6-7 overall and 3-6 in league action. Seward will have a long four weeks to go back to the drawing board before taking the court once again on January 4th when they travel to Independence to take on the Pirates to begin the second half of action in 2017.